First row, left to right: Narendar Singh, Amrik Singh, Anoop Singh, Avtar Singh. Second row, left to right: Inderjeet Singh, Baljeet Singh, Taranjeet Singh, Raju Singh. Third row, left to right: Rayil Singh, Maneet Singh, Mir Singh, Vicky Kumar. 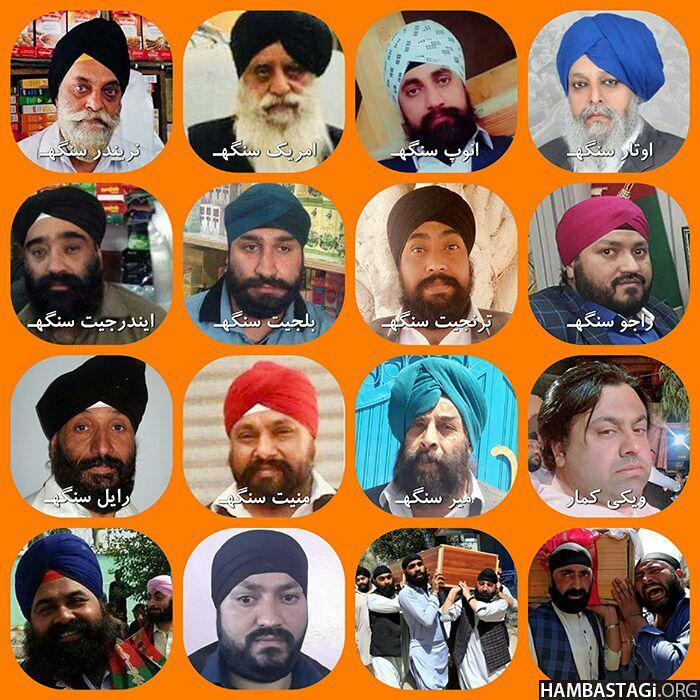 Last row, left to right: Two other unnamed Sikhs killed, and the Sikh community mourning their dead. A suicide bombing that killed at least 19 people in Afghanistan has been claimed as an Isis attack. Many of the dead are thought to be members of the minority Sikh and Hindu communities after the attacker struck in the city of Jalalabad. A further 20 people are believed to have been injured. Among those killed was Sikh community leader Avtar Singh Khalsa, who was travelling by car to meet the Afghan president when he died. The BBC reported that Mr Khalsa was planning to run in the country's parliamentary elections in October. The terror group released a statement taking responsibility for the attack. In a statement, the group said: "[The attacker] detonated his vest at a gathering of Afghan troops, and crowds of Hindus and Sikhs, who were on their way to meet the Afghan president". The statement also said the group was targeted as they were deemed "polytheists". Sikhs and Hindus often face discrimination in the Muslim-majority country of Afghanistan, and have been targetted by Isis before. Many Sikhs and Hindus have moved to India due to threats of violence. In a statement posted on Twitter, the Indian embassy in Kabul condemned the attack. They said: "We strongly condemn the heinous and cowardly terrorist attack in Jalalabad today which resulted in the death of 20 innocent Afghans, including 10 members of the Afghan Sikh Community, and injured more than 20 persons. "We convey heartfelt condolences to the families of the victims and pray for early recovery of the injured. "The attack again underlines the need for a united global fight against international terrorism without discrimination and accountability of those who support terrorists in any manner." 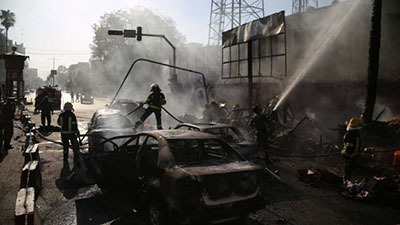 Tejvir Singh, the secretary of a national panel of Hindus and Sikhs, whose uncle was killed in the blast, said Afghanistan was no longer safe for Sikhs. "I am clear that we cannot live here anymore," he said. "Our religious practices will not be tolerated by the Islamic terrorists. We are Afghans. The government recognises us, but terrorists target us because we are not Muslims." Last month the Afghan Government was able to secure a historic three-day ceasefire with the Taliban over the holiday of Eid. However the temporary stay of hostilities did not include Isis.